You should know by now that I love a soup, a good soup. A healthy, thick smooth soup, of course.. there’s always room in my heart for a thin or chunky soup but they’re a special occasion kind of meal. 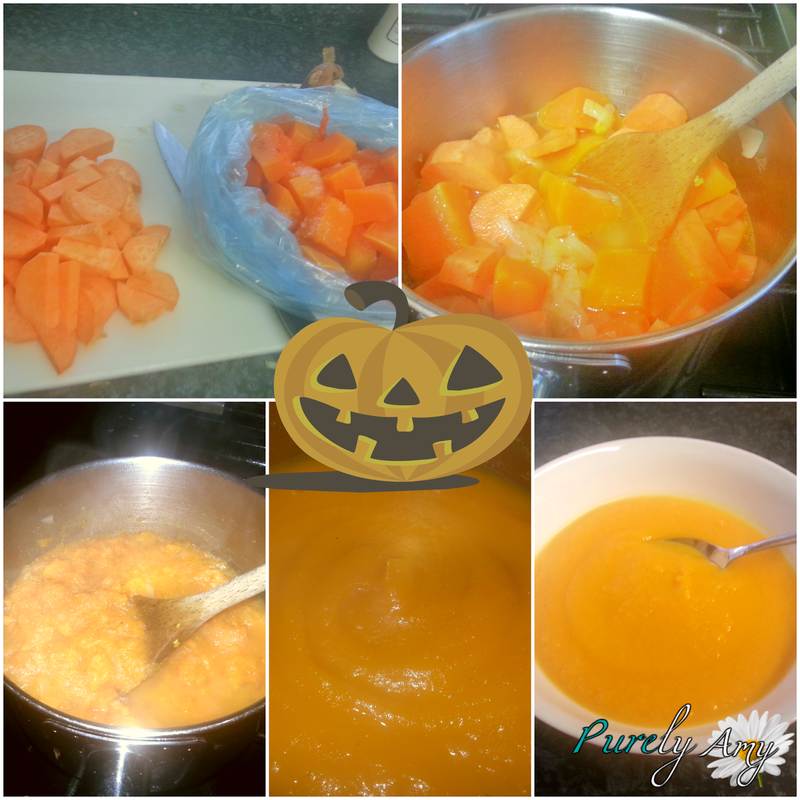 Since it’s HALLOWEEN I thought I’d use squash, like in my previous (southern veg soup), it’s such a neglected veggie, we only have it once or twice a year (maybe a few more if we’re lucky)A sweet creamy and thick soup, all you need is 15 minutes, four ingredients and a love of health, after all this is a Low Gi/Paleo soup. I was pottering around last week, after being quite ill the week before, a glass shattering cough and head cold to clog the airways. What’s the first thing you want when you’re poorly? Soup! I get memories from soup, mostly bad.. I hated soup when I was younger, It was always a ‘drink’, it didn’t fill me and it wasn’t a nice thing to have. One moment in particular , my mum had bought some cheap tomato soup and demanded that if I ate it as I would get nothing else.. (the only time I skipped a meal) and I cried for ages, or so I thought, I’m pretty sure my dad snook me some toast up before bed. A chunky vegetable soup in a wooden barn-style cafe that we’d ran into as the rain came down on our walk to the beach, our holidays were always walking holidays so we were around an hour away from the beach. We were soaking and as I and my brother sat down, mum went to get drinks, dad sat at the table with us. She came back with these luxury hot-chocolates with cream and marshmallows in We weren’t well off so having food out was like winning the lottery for us…Later that night I tried my first minestrone soup, and loved it, Soup can be an experience and remind you of your past, down to scenery and utensils you use to eat it it can bring back childhood memories. “Treating myself to something tasty without breaking the bank” It’s so simple and it’s not overpowering, it’s just ‘relaxing’. Baring in mind I’m not getting money for this recipe so I don’t need to ‘sell’ it in the description but I really want you to try it! 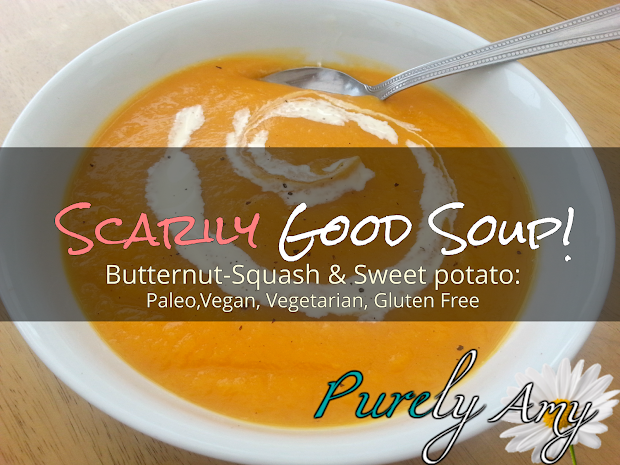 A gorgeously creamy sweet potato and butternut squash soup that's vegan, paleo and silky smooth! Excellently cheap for vegans on a budget! 1 tbsp butter/flavourless oil for frying onions. Finely dice your onion and pop into a large saucepan on medium heat with your butter or oil of choice, sweat down your onions until translucent. Deseed, peel and chop your Butternut squash into 1/3" cubes, Along with your Sweet potatoes. Whilst your onions are sweating down you can pop your kettle on and dissolve your vegetable stock into 1pint of water. Once your onions are translucent and not coloured add your butternut squash and sweet potatoes to the saucepan along with your flavoured water. Bring your pan to the boil, place a lid on the pan and simmer for 25 minutes, (or until tender). The more you make the longer it'll take. Once your vegetables are soft enough to break with a spoon, take your soup off the stove..
Now, you can either mash your vegetables down into a chunky soup or, like I did, cool it down and pop into a liquidiser. Serve with a gluten-free bread, I really think it needs a bread or something chunky to eat it with. Why not mix it up and try it with a wholemeal pasta, as a sauce, yeah, really. Remember I have tonnes of low-fat, paleo and sugar-free recipes floating around so make sure you pop up to ‘purely recipes’. Healthy recipes are not just for weight loss they’re for dinner! Thank you Harriet! I wish’d I’d have taken more pictures, these really don’t do the soup justice!